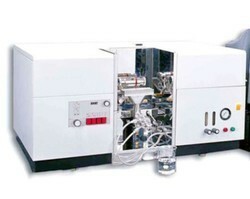 Our range of products include atomic absorption spectrophotometer s-929. PHOTOMETRIC Range : 0 to 2 abs. ACCURACY : ± 0.010 abs. AT 1.0 abs. ELECTRONICS : Operating system- Windows XP or 7 User Friendly software with graphics Serial port driven interface with Microcontroller. FLOW CONTROL : Pre-turned pressure regulators with indicator gauges. Flow Controlled by Rotameters.